As a result of where we are in the maturity cycle and to support the business units better, we are seeing a new emerging role “CIO – BI” that is dotted lined to the global CIO or a shared services leader. Let’s look at a representative job posting from GE Capital, which always seems to be a step ahead of most companies. Chief Information Officer – Business Intelligence provides strategic direction for all BI information systems, technology and reporting across GE Capital Americas. Helps lead the “Raw Data -> Aggregate Data -> Intelligence -> Insight -> Decisions” chain. This role is responsible for developing and executing a BI strategy, simplification, technology enhancements and projects across all platforms and functions. This position also supports BI initiatives at Capital HQ Risk, GE Treasury and leads the BI COE within Capital Americas. 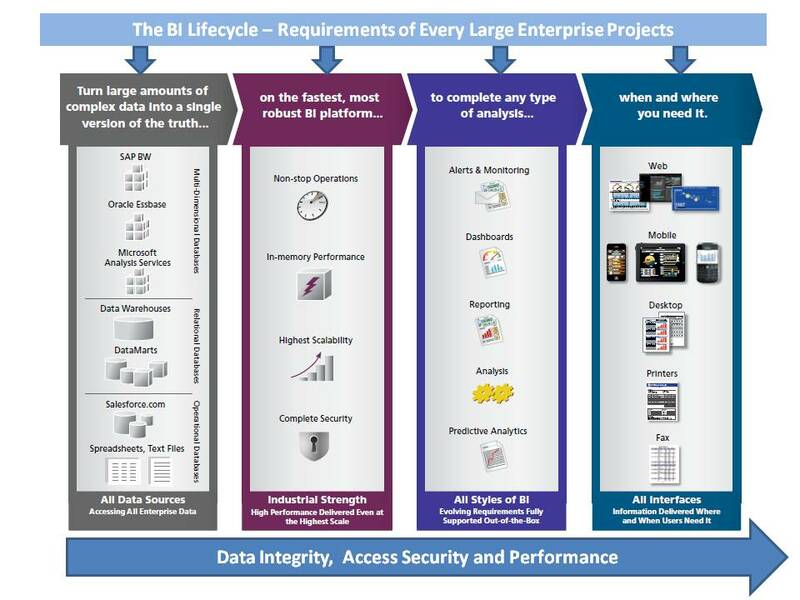 Provide strategic oversight of all BI applications, projects and programs. Leads change across large platforms / functional areas using innovative technology solutions. Manages full suite of applications supporting the business. Plans and schedules team development activities and manages external spend. Works with key constituents to drive improvements in development performance and quality. Shapes, drives and takes responsibility for delivering significant strategic initiatives across broad scope/platform(s). Bachelor’s Degree (or equivalent work experience) with 10+ years’ of Information Technology experience. Experience in controllership, planning, designing, building and/or running IT operations. Companies don’t really need more data, they need insight. What to do with the data? Data is worthless. Data must be used in context. So tools to create insights is absolutely the target. The target objective is to create information-as-a-service (or data services) to support new business requirements such as real-time BI, self-service customer portals, and single-version-of-the-truth. Every CIO-BI role is a new role but one that has a clear objective – help deliver information-as-a-service to a variety of applications (consumers). With the growing complexity of data, increasing volume of data, and exploding security challenges all driving demand, getting a senior leader who is in charge of delivery Information-as-a-service makes eminent sense. Another objective is to coordinate the strategy and investments in a hub-and-spoke model (what — apps, middleware, foundational infrastructure — is centralized vs. what is decentralized). Even in a volatile economic climate, most organizations are continuing to expand their investments in BI, Analytics, Big Data and basic data management. Companies don’t really have a choice as digital data generation and storage is doubling every year and they need to leverage the data to shape/direct strategy. As we move from a departmental BI focus to an enterprise BI focus…there is a lot going on related to data in organizations today. Simply look at the table below. It is enough to make your head spin. Without a dedicated person who is knowledgeable and keep multiple projects on track it’s hard to execute at the enterprise level. I expect this role to grow significantly in the coming years, especially as existing data integration trifecta (people, process and technologies) are failing to meet new requirements. Companies that embraced a data-centric strategy over the years aren’t looking back; they’re continuing to expand its usage to support more requirements such as real-time data, creating data domains, improving the ability to securely deliver information, integration with unstructured data and external sources, various Web portals, and enterprise search. Based on our research, we are still at the very early stages of a powerful secular growth cycle for BI and Analytics-related innovation. Getting this assimilated into enterprise business processes and flow is going to take leadership, patience and execution talent. Why the need for new leadership? Dramatic improvements in analytics have made it possible to analyze massive volumes of data. Now, the quest for insight can go beyond limited summaries and aggregations and tap all data sources, both structured and unstructured. New methods of working with big data, such as Hadoop and MapReduce, offer interesting new alternatives to traditional data warehousing. Success is achieved by knowing when and how to use the tools. Mr. Chief Intelligence Officer – BI; welcome to the hot seat. Your job is to deliver cross enterprise, cross application, cross technology Information-as-a-service (next generation data services). Oracle at Openworld 2011 announced that it has installed 1,000 of its Exadata database machines with customers. This is an impressive trend as these machines go for several million $ each. Oracle also announced their new Exalytics data analysis machine. The logic: secular migration towards unstructured data has created a large and meaningful addressable opportunity in managing, regulating and monetizing the use of information.